Two- or three-row sport utility vehicle? Five-, seven-, or eight seater? Those are the questions a lot of people have been asking themselves when considering what SUV to buy. While there's great versatility in a three-row SUV, there are also significant drawbacks. Want to know what we mean? In this comparison guide, we'll compare the two-row Hyundai Santa Fe with the exclusively three-row Honda Pilot. They're both mid-size sport utility vehicles, and they're both about the same length. We hope to show what a difference a row can make, so you can make the best decision for you. The more raw materials used, the more expensive the car. That's not a perfect rule, but it seems to apply in this case. The 2019 two-row Hyundai Santa Fe starts at $25,000. It's worth noting that Hyundai offers a three-row Santa Fe XL, but be prepared to pay almost $6,000 more for it. Same goes for the Honda Pilot, which starting at $31,450, also costs a pretty penny more. Unless you regularly drive with more than five people, you can already save a bunch of money by getting a two-row SUV like the Hyundai Santa Fe. 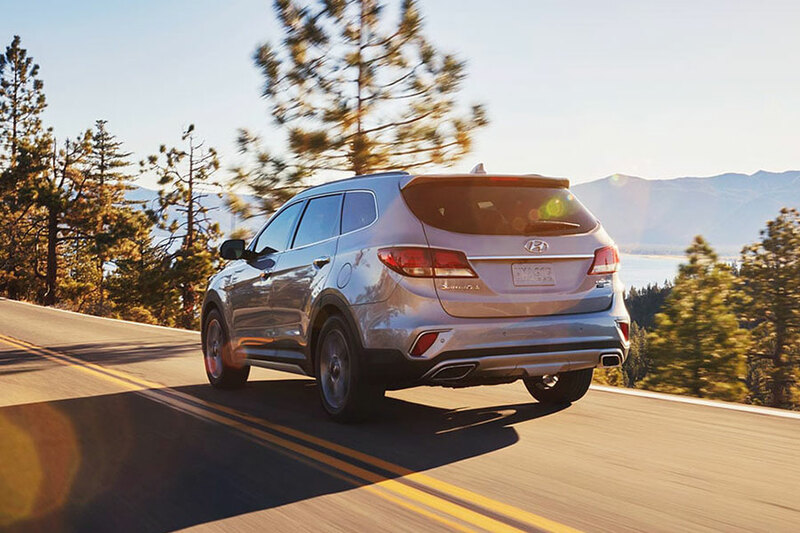 Just so you know, the 2019 Hyundai Santa Fe is incredibly fuel efficient for its class. The Santa Fe gets an amazing 22 city miles and 29 highway miles per gallon. The Honda Pilot, on the other hands, gets just 19 city and 27 highway miles per gallon. So the Santa Fe would end up saving you hundreds of dollars a year in fuel costs. That's due, in part, to the added weight of the Honda Pilot, which is almost 500 pounds heavier than the two-row Santa Fe. While the Honda Pilot can, of course, seat more people, its occupants will feel the squeeze. Front row passengers get three extra inches of leg room in the Santa Fe compared to the Pilot. Second-row occupants get 2.5 inches more leg room in the Santa Fe. And the third-row passengers in the Honda Pilot get only 32 inches of leg room. So, bear in mind that the trade off of having a third row is tighter accommodations for everyone, including the driver and front-seat passenger. If you think about it, cargo space will also be affected by a third row. Open the back on the Hyundai Santa Fe and you immediately encounter 36 cubic feet of cargo space. Do the same on the Honda Pilot and you're only looking at 16.5 cubes. While it's true that you can fold down the third row of the Pilot to expand that cargo space to 46.8 cubic feet, we find that to be a lot of effort. If you're anything like most drivers, you can probably count the number of times you folded down an entire row of seats on one hand, especially if car seats are part of the picture. As you can see, getting the two-seat options saves you money at the dealership and at the pump, while also giving you precious extra inches of leg room up front and freeing up immediately available cargo space. If you have more than five in your family, the Honda Pilot or optional three-row Santa Fe XL make sense. But for everyone else, the two-row 2019 Hyundai Santa Fe is a better deal.